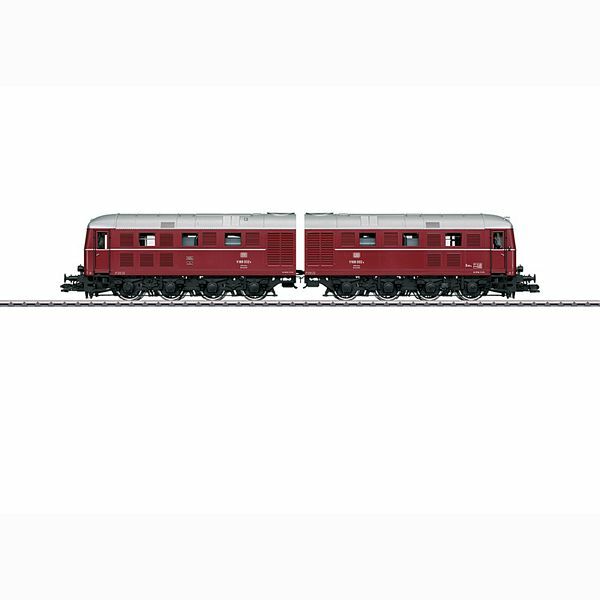 Prototype: German Federal Railroad (DB) road number V 188 002 a/b double diesel locomotive in an Era IIIb crimson paint scheme. Rebuilt version without a roof addition with a Maybach motor. Four sand boxes per side and locomotive half. Exhaust for the Webasto equipment is a pipe. The windshield wipers are the rebuilt version without visible rod linkage. Stationed in Gemünden/Main. Model: The locomotive is completely new tooling. The frame and body are constructed of metal. The locomotive has many separately applied brass and metal parts such as grab irons, metal signs, and windshield wipers. It also has a DCC digital decoder and extensive sound functions such as running sounds, locomotive whistle, and much more. The locomotive can be operated with AC, DC, Marklin Digital, and mfx. Each locomotive half has a powerful motor with all driving axles powered. The white headlights with LEDs change over with the direction of travel, will work in conventional operation, and can be controlled digitally. There is white LED lighting in the cabs that changes over with the direction of travel. Vents in both locomotive halves are electrically powered. There is exhaust smoke from both stacks and it can be controlled electrically. The engine room lighting can be controlled. The engine room details and cab details are modelled. The cab doors can be opened and Cab 1 has a figure of a locomotive engineer. The buffer beams have sprung buffers and separately applied brake lines. The locomotive has factory-installed, electric working Telex couplers at the end of each locomotive half. The Telex couplers can be replaced by two reproduction prototype couplers included with the model. The two locomotive halves are connected by a separable drawbar with a guide mechanism. Minimum radius for operation 1,020 mm / 40-3/16". Length over the buffers 70.3 cm / 27-11/16". Double locomotive with 2 motors. Completely new tooling, constructed of metal with separately applied brass parts. Roof vents powered by servomotors. Exhaust smoke from both stacks. Engine room lighting can be controlled. Connecting drawbar with a guide mechanism between the locomotive halves. Digital remote controlled Telex couplers front and rear.